Putting a baby to sleep can be a gargantuan task, but sometimes a little white noise is all that you need. Rather than filling your home with big white noise machines, you can turn your phone into a relaxing sound box that will help keep things calm in your home. The parents in our office suggested one amazing iOS app to present to you today - Baby Sleep Sounds: White Noise. We have discovered an incredible app on the iOS platform that can help you relax and put your baby to sleep with an ease. The app is called Baby Sleep Sounds: White Noise, created by the same developers who brought us one of the best baby sleep apps “Instant Baby Sleep”. Easy to use, simple to navigate, it is designed for both iPhone and iPad and totally free. Babies simply adore the soothing white noise sounds. Hearing these kind of sounds can make them calmer and more relaxed. That’s why Baby Sleep Sounds: White Noise features carefully selected and hand-picked, high-quality white sounds. You can choose from multiple different sounds, like: washing machine, hairdryer, womb, vacuum cleaner, baby shusher, sshhh, car ride, ocean and tv static noise. 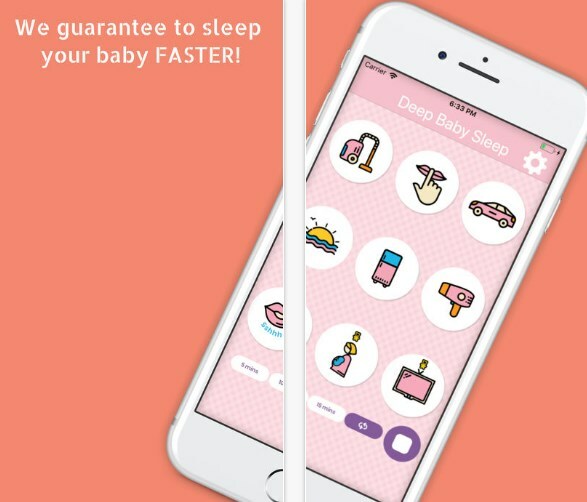 Tap the app to start and choose one of the sounds and in just few minutes your baby will fell into a deep sleep. Then, you can do your own family tasks, have some free time or simply watch them sleep. Enable your baby to have enjoyable naps and sleeping by downloading this one of a kind app from the App Store, completely free of charge.